I love economics. My love for the subject as my late father would say stems out of the fact that I was conceived during his schooling days at the School Of Administration, Legon. Rather witty though but my appetite for the subject continues unabated. Whilst at the Senior High School in 2014, my love for economics increased with how the then-vice presidential hopeful of the NPP-Dr. Mahmadu Bawumia dazzled Ghanaians with his economic dexterity. His ability to read the story behind figures and graphical presentations thrilled me and some colleagues of mine. Nonetheless, five years thenceforth, he appears to be quintessential of the Ghanaian meritocratic class-good draftsmen but bad implementers. After setting a convoluted 175 economic questions for the former vice president-Kwasi Bekoe Amissah-Arthur without a marking scheme, he looks clueless on how to implement what he proposed. That albeit, the president has called for a nationwide discourse on what he thinks is affecting the local currency-cedi. He believes that our insatiable crave for imported goods is the cause the cedi’s depreciation against the major currencies. Such a conversation, I believe should go on at the Flagstaff house not on our ever busy public space. 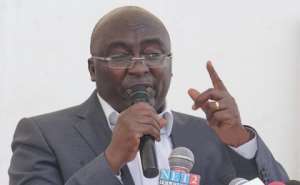 This is because, in the NPP’s 2016 manifesto, it stated on page 6 that “they will shift the focus of economic management from taxation to production”. Also on Trade and Industry, it stated that they will pursue aggressive industrialization and value-addition to agricultural produce, stabilizing the currency and promoting exports, especially of value-added agricultural produce and light manufactures amongst others. So what is preventing this government from pursuing such policies? Personally, I believe the concept of buy Ghana, wear Ghana, and see Ghana etc. is a master class of an idea for economic transformation, but it shouldn’t be limited to the president wearing locally made textiles. There must be a commitment on the part of the government to sustain it. Where is the “Made in Ghana” policy launched in March 2016? In a country where government is the largest spender, the government should set an example for the citizens to follow. During procurement processes, we opt for foreign goods at the expense of local ones. Local contractors are supposed to beg even before they get contract. Even our banking sector is dominated by 80% foreigners. Monitoring from citinewsroom.com , I observed that says 82% of our imports is rice. But the rice factory at Aveyime has shut down due to lack of funds. Whilst rice remains the most consumed delicacy in most of our schools, the government prefers rice from Thailand and Vietnam at the expense of locally produce ones. The fact of the matter is that, propounding policies does not make it work, neither does launching them. It is the commitment of government to make the policy work that makes it thrive.